Pictured are (left to right) Jo Beth Smith with Make-A-Wish, Edward Jones FA Isaac & Jenn Mills, FA John & Kim Lewis, FA Lesley Marrero, & FA Steven Deshuk. MASON COUNTY — Two West Virginia boys had their wishes to visit Walt Disney World come true thanks to a nearly $12,000 grant to Make-A-Wish® West Virginia, Ohio and Kentucky from Edward Jones financial advisors and their families. Lewis, 9, of Point Pleasant, West Virginia, was diagnosed with osteosarcoma in March. Before a scheduled surgery in April, Lewis and his family flew to Orlando, Florida, for a fun-filled, worry-free week of fun Walt Disney World, Universal Studios and Sea World. Having never before seen the ocean, Lewis and his family made memories as they played on the beach and went fishing and horseback riding. Eight-year-old Myles of Milton, West Virginia, was diagnosed with Duchenne’s Muscular Dystrophy. When asked where he wanted to go, without hesitation, Myles replied, “Disney World.” Come this September, that’s exactly where Myles and his family will be headed. 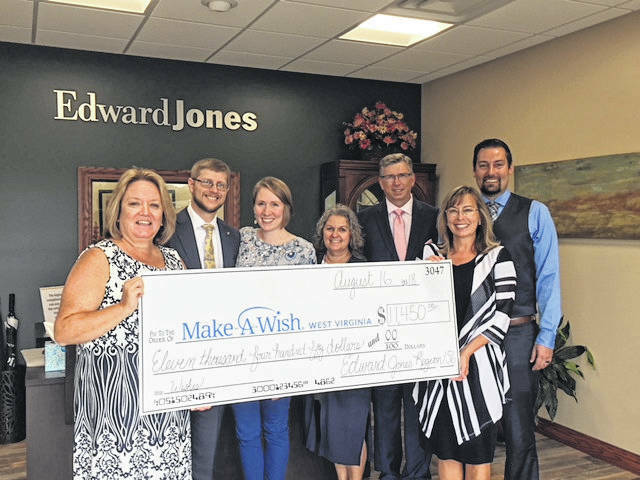 The more than 50 Edward Jones financial advisors and their families from West Virginia, Ohio and Kentucky raised the funds during an annual regional meeting in July. While the financial advisors discuss business at these summer meetings, families are encouraged to attend and participate in a variety of activities. Edward Jones, a Fortune 500 company headquartered in St. Louis, provides financial services in the U.S. and, through our affiliate, in Canada. Every aspect of our business, from the investments we offer to the location of our branch offices, caters to individual investors. Our 15,000−plus financial advisors serve more than 7 million clients and care for $1 trillion in assets under management. Edward Jones ranked No. 5 on the FORTUNE Magazine “100 Best Companies to Work For®” in 2018. Visit us at www.edwardjones.com. Our recruiting website is www.careers.edwardjones.com. Member SIPC. Make-A-Wish® Greater Pennsylvania and West Virginia is a nonprofit organization that creates life-changing wishes for children, aged 2 ½ to 18, with critical illnesses. For more information, please call Make-A-Wish® at 800.664.9474 or visit wv.wish.org. https://www.mydailytribune.com/wp-content/uploads/sites/42/2018/09/web1_9.20-Edward-Jones_ne201891912211340.jpgPictured are (left to right) Jo Beth Smith with Make-A-Wish, Edward Jones FA Isaac & Jenn Mills, FA John & Kim Lewis, FA Lesley Marrero, & FA Steven Deshuk.